This is the start of a project that I need a bit of help on. I want to make the rear hatch on my PT cruiser open fully using a button on the remote. On my 2006 PT Cruiser the rear-hatch is electronically "popped" when you press the button on the back of the emblem. (it is not a mechanical latch) You then have to manually pull up on the hatch to get it fully open. 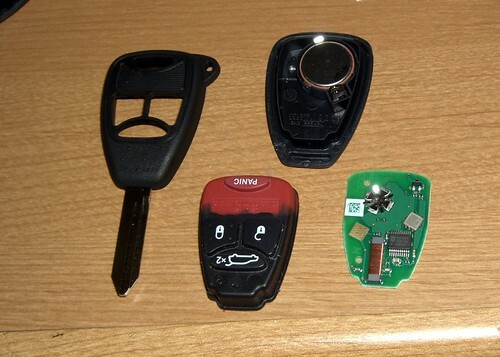 I discovered that there is a unused button inside the key fob that will activate the pop-circuit. It seems it is wired exactly the same as a mini-van that has this feature. 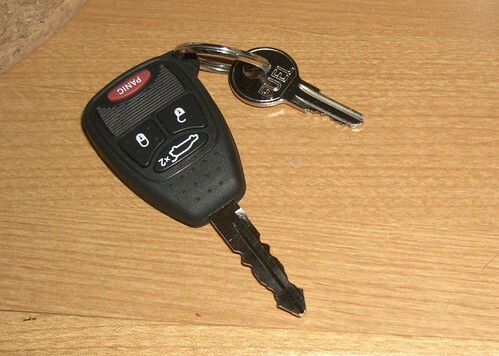 The first part is to get a keyfob that has the external button I need. 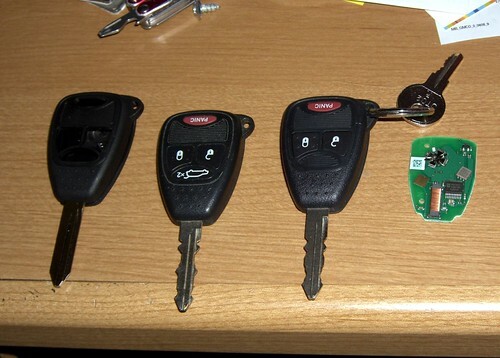 The easiest way to do that is to buy a keyfob off eBay for a Dodge/Chrysler/Jeep that has the button to open the rear hatch. Now the hard part is how to make the hatch open fully without a ton of modification. The remote will pop the lock and push the door open slightly. Does anyone know of a easy way to make it open fully? I am not sure if a door popper would be able to do this, it seems they only push a small amount. A gas cylinder would require extra pressure when closing. It seems like a linear actuator could do it, but that sounds expensive and possibly complicated to me. I've shaved the rear hatch of my PT severalyears ago. To open it I added a door opener solenoid to the latch internally. To phyisical open the door, I installed a couple of springs behind the lower door rubber pads. They push the door just enough to clear the latch. I have been researching an automatic opener and closer for sometime now. Linear actuators take up to much room. The mechanism from other cars is just to expensive. I'm now looking at pneumatic cylinders, since I already have air suspension in the car, I have the compressed air I'll need. Spring would work. Do you have a source for those, or a recommended spring? Is this what you mean by a spring? Last edited by zapwizard; 21 Jun 2007 at 10:42 am. Ok, so I bought the springs I linked to above. They are designed to clear the door of the latch, so I can open it by hand easy enough. But that doesn't make the hatch fully open. Are the specific compressors for cars that are quiet? All I can seem to find is tire pumps or airbrush compressors. Does anyone know of a way to replace the stock air cylinders (Assist arms) with ones that could be driven with a pump? It seems like that would be the most stock looking, and require less modification to the car body. I got all my parts of eBay finally. -My original remote and the PCB from it. I took all the keys apart and re-combined them into a new fresh key that has my original transponder, the used rubber buttons, and a new un-cut key. I took the key to Lowes and they were able to cut it based on my original key. simple, cheap, stock, and no secondary remote to lug around. Last edited by zapwizard; 28 Jun 2007 at 10:23 pm.